After years of being told by the media that “I Love Rock ‘N Roll” is the only Joan Jett song that deserves to be on any of their countdown lists, I decided to ask YOU, the Jettheads, what song YOU would pick if you were ever given the chance. No holds barred, every vote counts. So, let’s get started with #55 through #46! First released on Album in 1983 and re-recorded for Sinner in 2006, A Hundred Feet Away (Jett/Laguna/Anders) is a sweet and simple tale of unrealized potential. I LOVE the guitars, the melody, and especially the lyrics. And of course, this song is absolutely awesome live. Written by Joan the day after a Bikini Kill show, this song first surfaced on 1993’s Flashback, and on Pure and Simple, Evil Stig, and USA (UK Promo). The versions are nearly all different from each other. I admit, I voted for this one. It’s highly personal to me, and I wept the first time I heard it. I think it’s one of Joan’s best ballads, and it showcases the tenderness in her voice beautifully. From Pure and Simple, written by Joan with Desmond Child. The 8th track of I Love Rock ‘N Roll, written by Joan Jett, Kenny Laguna, and Greg Kihn. Great rhythm. …as opposed to The Runaways’ song of the same name, which did not make the list. You won’t find “Black Leather” in the Rap/Hip Hop timeline of the 80’s, but Scorpio of Grandmaster Flash & the Furious Five, and other hip hop icons of the day, wrote and recorded this rock-and-roll rap song with Joan for 1986’s Good Music album. You can also hear the demo version on Flashback. #49 Do You Wanna Touch Me? WOW, I can’t believe this hit from Bad Reputation didn’t rank higher! Even people who barely know Joan will stand up and dance for this one at her shows. (Pay attention to the overhead claps in this video. THAT’S what we want to see at shows! Yeah, oh yeah!). So, so happy to see this one back in the set list. Yet another signature tune from my tortured childhood, but its truth is universal. From 1983’s Album. #46 Have You Ever Seen the Rain? 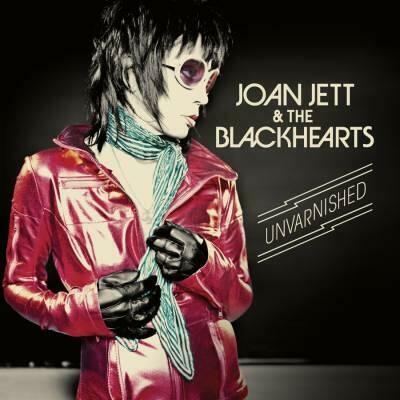 A Creedence Clearwater Revival song from 1990’s The Hit List, and one of Joan’s best covers. It was a number one hit in southeast Asia that year, and played in a second-season episode of The Wire, “Port in a Storm,” in 2003 (Source: IMDB). How do you like the list so far? Are you surprised any of these didn’t rank higher? There’s a lot going on today, with all the #HappyBDayJoanJett activity, so I’ll post the next installment, #45 to #36, in a couple of days. This entry was posted in Polls and tagged I Love Rock N' Roll, Joan Jett. Bookmark the permalink. Ahem. I have a couple of thoughts. ; ) I can’t wait to see the rest. Seeing this part of the list really intrigues me as I agree, I’d have thought several of these would rank higher. You are awesome for pulling this list together with descriptions of each song and videos – love you for your devotion to JJ ! The first time i’ve heard “a hundred feet away” i remember my thought was “wow, this is a little jewel !! !”, and that’s what i still think about it… i mean, Joan Jett really knows what rock’n’roll ‘s got to be…and i adore her style, simple, hard, and honest. she’s a nice person!! Fixed it. Thanks Jeff! I swear I knew that. ROTFL!